In the operational domain, jihadist organizations continued to use cyberspace to promote propaganda for operational purposes, including strengthening of the media campaign, recruitment of activists and encouragement for "lone wolf" attacks. Particularly prominent during this period was a new online campaign encouraging biological terrorist attacks. In the defensive domain, there was no discernible significant innovation in the defensive use of cyberspace by terrorists. The trend of distributing content on issues of security and encryption, privacy and anonymity, warnings against phishing and the safe use of mobile devices continued. In the offensive domain, terrorist organizations continued their efforts to improve their offensive capabilities but those capabilities are still undeveloped and remain at a low level, in our assessment, especially with regard to hacking social media accounts or Web site defacement. During the period under review, a trend was identified of recruiting hackers to subgroups of the UCC collective; most of which were Indonesian in origin. In the domain of global counter-measures against cyber threats, we identified a trend of expanding the use of technological systems in the fight against terrorism, including blockchain technology, facial recognition and artificial intelligence. 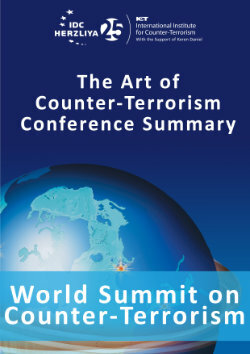 In addition, documents, research and memos on terrorism in general, and cyber terrorism in particular, were published.